In a nutshell, cooking with coconut oil is healthy, makes you burn more body fat faster, plus it’s fun! Did you know that coconut oil has been called “the fat-burning fat” and “the healthiest dietary oil on earth”? It’s true… you won’t want to miss the many coconut oil benefits – especially the 4 massive coconut oil weight loss benefits. 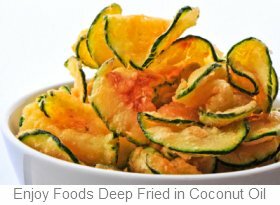 Imagine guilt-free deep fried foods or healthy mayonnaise – what a concept! Well, that’s because coconut oil doesn’t oxidize at higher temperatures, being ideal for high-heat cooking. Cooking with coconut oil helps you lose weight BIG TIME because this fat is digested differently than the other saturated fats. Rather than being stored as body fat, coconut oil is immediately metabolized in your liver supplying you with instant energy, while any excess is transformed in body heat. Another one of the coconut oil health benefits is that it gently stimulates your thyroid, which is typically sluggish if you have a low metabolism. As a result, your metabolic rate increases with up to 25%, so you burn more body fat, faster. This is actually the reason why coconut oil is recommended on the best diet for hypothyroidism. Plus, since insulin isn’t involved in its digestion, using delicious coconut oil recipes is a big help when you are on a low carb diet. Unlike most other bad cooking fats and oils, coconut oil is very stable and not damaged by higher temperatures, so you can keep it on your shelf for up to 3 years – the longest of any other food oils. In its solid state, coconut oil is pure white, over 76 F it becomes crystal clear. It’s best to store it out of direct sunlight, but you don’t have to refrigerate it. Look for organic, extra-virgin, cold-pressed, unprocessed, unrefined, untreated coconut oil made from fresh coconuts – it’s the best stuff, bar none. Try to avoid the cheaper variety, which is made from dried coconut (copra) that is chemically refined, then bleached and deodorized – this oil doesn’t have most of the popular coconut oil benefits. Over the years I’ve tried a lot of brands in various coconut oil recipes, but my favorite is Nutiva’s organic, cold-pressed, extra-virgin coconut oil coming from Philippines coconuts. I found Nutiva’s coconut oil to be the highest quality, smooth, creamy and light, with a very nice aroma – not too bland nor too strong. Plus, Nutiva’s containers are BPA-free (BPA, or Bisphenol-A is still commonly used in tin cans and plastics, although “it was shown to have hormone-like properties that raise concern about its suitability in consumer products and food containers” (you can read more about BPA’s toxicity issues at Wikipedia). If you can’t find Nutiva or other high quality coconut oil in your local health food store, you can buy it at Amazon: it comes in various sizes, but for the biggest saving (37%) plus free shipping, you may want to get Nutiva Organic Extra Virgin Coconut Oil, 54-Ounce Containers – you’ll find that currently this is their best deal. Want to know how using it in delicious coconut oil recipes gives you an immediate metabolic and energy boost helping you burn more body fat? 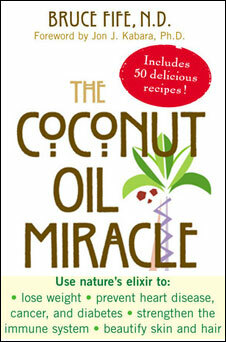 Then, take a look at The Coconut Oil Miracle by Bruce Fife, N.D., a naturopathic doctor and one of the world’s leading expert on coconut oil health benefits and on various ways of cooking with coconut oil. You’ll discover little-known info on this nature’s elixir with countless coconut oil benefits – from fast weight loss to anti-aging… Plus, a practical nutrition plan for busy people containing dozens of delicious and quick coconut oil recipes. Not only will it be hard for you to put this book down, you’ll want to give it to everyone that you truly care about. If you’re intrigued by the concept of “eat fat to lose fat”, read more here.